With major sporting events such as the Tokyo 2020 Summer Olympics and the Qatar 2022 FIFA World Cup on the horizon, it’s more vital than ever to have a comprehensive understanding of the way that different environmental conditions impact physical performance. With record-breaking temperatures of over 40 degrees Celsius, Tokyo is predicted to be the hottest Summer Olympics ever, raising important questions about how athletes will be able to cope with the intense heat while performing to the best of their ability. Associate Professor Julien Périard’s research at UCRISE investigates some of the constraints to physical performance in team sports, using an environmental chamber to examine some of the physiological mechanisms that mediate health and performance. "My research interest is in environmental physiology, primarily heat but also altitude and hypoxia," Julien said. I’m trying to look at the mechanisms which mediate sports performance, so looking at how and why performance is impaired in the heat. According to Julien, athletes show improved exercise performance as well as improved thermal comfort with chronic exposure to heat stress. "We’re looking at heat acclimation protocol, so that’s putting people in the heat repeatedly over several days to get them adapted to perform in the heat, so that performance is less decreased. You’ll never get to quite the same level, but it helps with improved performance and minimises the risk of exertional illness as well," he said. "We’re focusing on team sport athletes. If you think of a soccer player or a field hockey player, it’s not really an endurance sport where you just go for a long run, it’s intermittent." 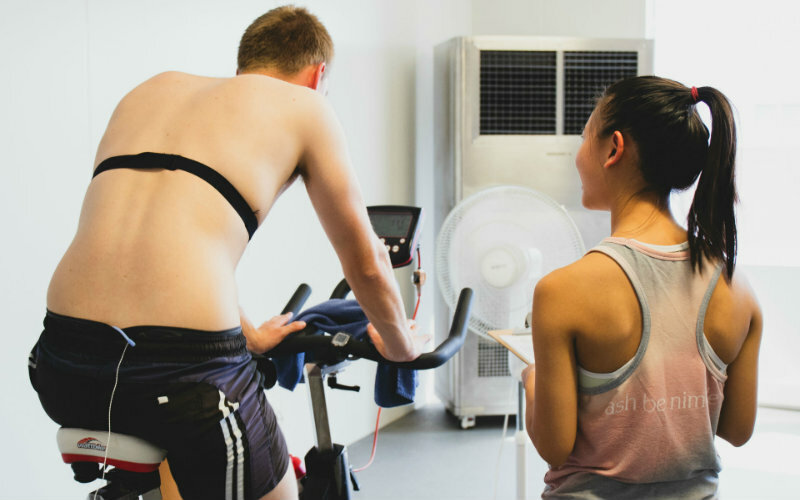 When acutely exercising in hot environmental conditions, an athlete’s whole-body temperature increases, as well as their cardiovascular response and perceptions of exertion, leading to impairments in performance. In response to this, Julien’s research sees team-sport athletes undergo a repeated sprint protocol, where they complete four sets of five sprints followed by five minutes of rest and then another four rounds. His research will contribute to an understanding of how to ensure that there is as little risk as possible to athletes competing in these conditions in events such as the Olympics. We want to see if those short protocols induce heat adaptation, and we’re taking muscle biopsies to see if it induces any adaptations of the muscle level, because it’s quite an acute and chronic stress. Dr Périard’s research would not be possible if not for the environmental chamber facility available at UCRISE, which enables a controlled heat environment where they can closely monitor athletes' cardiovascular responses to exercise. "We’ve had this equipment for four or five years, but we’ve just recently upgraded it so that it’s better in terms of holding temperatures and controlling the humidity," he said. "We also want to look at using heat stress and hypoxia in obese individuals, and people with systemic inflammation, to see if that helps with increasing blood flow and muscle size and functional things like that, which you can potentially develop just by being exposed to the heat on a regular basis." UC Capitals star Leilani Mitchel says her mum, always wanted her to play for Australia despite being born in the United States and growing up in Washington. University of Canberra alumni and CEO of R U OK? Brenden Maher reminds us that having meaningful conversations with one another could save lives. Research Professor Christian Cook, from the University of Canberra’s Research Institute for Sport and Exercise (UCRISE), has been studying the impact of stress on high performing individuals – athletes, teachers and medical practitioners – and his findings have informed the need to develop coping mechanisms to deal with stress.